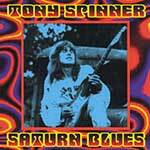 Tony Spinner is a bluesman once removed  he plays hard-driving rock influenced by blues, the kind of music once practiced by such '70s bands as Uriah Heap, Wishbone Ash and Humble Pie (and still practiced by Aerosmith). His guitar features lots of feedback and effects, and the whole '70s flashback feeling is reinforced by the psychedelic packaging of the album. Spinner is a hell of a guitarist; he's a master of his numerous effects boxes, not a slave to them, and with just his one instrument can create a wall of sound that grips the listener. Good stuff, sure, but it's kind of a stretch to market it as blues.